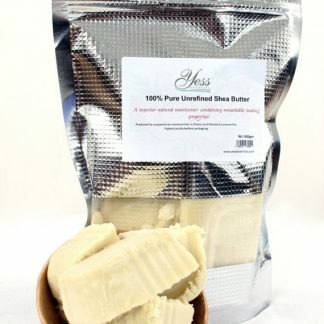 An excellent 2-in-1 natural exfoliator and cleanser, made with raw African black soap (100% natural organically derived soap made from cocoa pod husk ash and unrefined palm kernel oil) and uniquely blended carrot and cucumber extracts, almond oil, soybean oil, olive stone powder and essentials oils. Removes all the grime and surface dead cells that can block pores. 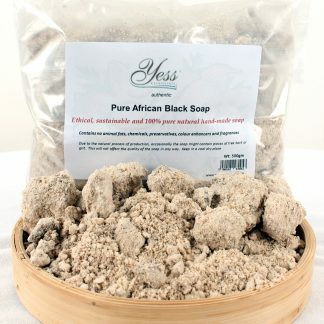 Yess Essentials African black soap facial scrub, an excellent 2-in-1 natural exfoliator and cleanser, made with raw African black soap (100% natural organically derived soap made from cocoa pod husk ash and unrefined palm kernel oil) and uniquely blended carrot and cucumber extracts, almond oil, soybean oil, olive stone powder and essentials oils. Cucumber extract, rich in minerals and amino acids and help to tighten, refresh and tone the skin. Carrot extract in Soybean oil; a good pore cleanser and rich emollient, helps balance skin oils and smooth out fine lines and wrinkles. Soybean a good source of vitamin E, Lecithin and Sterolins, help protect skin from environmental stresses and free radicals. Essential oils blend for the fragrance with a therapeutic twist. 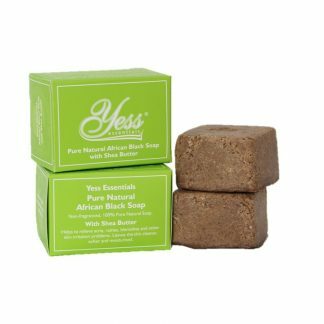 Yess Essentials combines the benefits of the traditional African black soap with modern materials to give an excellent African black soap facial scrub and also as an African black soap facial cleanser, that removes all the grime and surface dead cells that can block pores and lead to spots, acne and blackheads from the skin without drying it out. 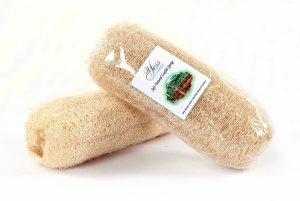 The African black soap facial scrub is excellent for all skin types, particularly for sensitive skin. 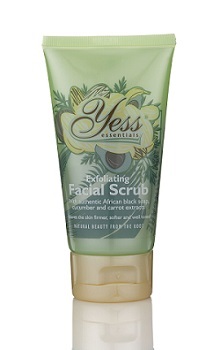 Great face scrub for black skin leaving the skin softer, firmer and well toned. For effective use of the African black soap scrub. massage gently to the moistened face with circular upward movements of the fingers, avoiding the delicate areas around the eyes. Rinse well with clean water. Suitable for a daily facial wash. For the facial wash, lather small quantity in hand, rub on face and rinse well with clean water. Excellent natural cleanser and exfoliating cleanser for sensitive skin.